Are you trying to find a process server? Hawkins Investigations & Adjusting specializes in difficult process service. An attorney service can be effective in simple matters; however, if you have a case in which the defendant or witness is avoiding service, you need the experience of a private detective. Our private investigators research home and work addresses for the subject. Next, we identify vehicles to determine where the subject actually is living and working. Tactics can include surveillance of a subject coming or going from home and work. Then in other instances we devise very creative ruses to lure the subject out in the open. Our private investigators will get your papers served! “Notifying a person that he or she has been named as a party to a lawsuit or has been accused of some offense. Process consists of a summons, citation or warrant, to which a copy of the complaint is attached. Subpoenas are court orders which, if properly served, compel the attendance of the witness in court. All process servers are not alike. Hawkins Investigations & Adjusting treats every client as an individual and we handle their specific needs and concerns. Our investigators have experience in law enforcement, investigations, research and civil procedures. Hawkins Investigations & Adjusting can assist you on your document needs. Choose Hawkins Investigations to be your process server. 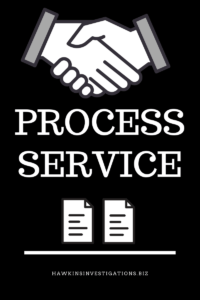 Call us for all of your process service needs!